LeiLei Secor, 19, lives in upstate New York but goes to college at the University of Virginia, which means she’s paying out-of-state tuition. Even with a scholarship, the cost of her education is high -- around $40,000 a year. Though she hasn’t declared a major yet, she plans to apply to the school’s business program. The plan is to concentrate on economics and foreign affairs if she doesn’t get in but given Secor’s business acumen, rejection seems unlikely. In three years, this teenager has used her artistry, marketing abilities and time-management skills to rake in $100,000 on Etsy selling handmade jewelry on her shop DesignedByLei. Think: dainty layered necklaces, statement pendants, knuckle rings and her latest obsession: wire jewelry. Not only does it provide a creative escape from schoolwork but also is a way for Secor to pay for college tuition. Because of her achievements, Secor received the National Federation of Independent Businesses’ Young Entrepreneur of the Year Award in 2014 and recently was able to launch her own website. It would be nice to have a little extra cash coming in, wouldn’t it? Luckily, Secor offered up some advice on how to tip the scales of fortune in your favor using online sales platforms like Etsy. It’s common knowledge that social-media marketing is a must-have strategy. While Facebook and Twitter might be the first sites to come to mind, they’re hardly your only options. For Secor, the biggest website was Wanelo, a community platform for shoppers. Thousands saw her products on this site, while Facebook didn’t generate much traffic for her because she doesn’t pay for ads. “Another big one was Tumblr,” she says. 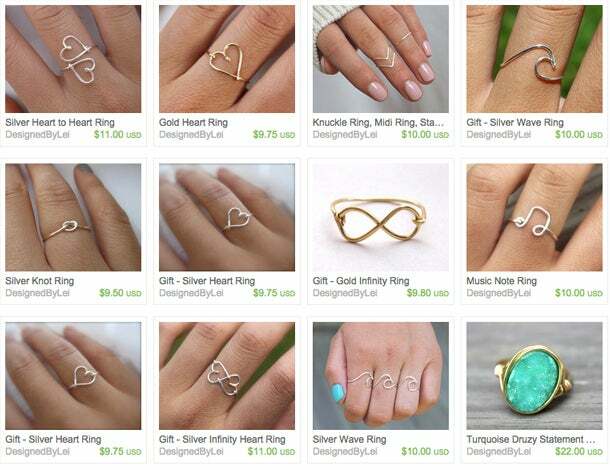 “One of my rings got reblogged about 50,000 times.” Meanwhile, Pinterest hasn’t been as effective. Go where your customers are and use what works for you, even if it’s not what you expect. Handmade jewelry is a very crowded industry, especially for online sellers. Secor knew she had to stand out in a big way and managed to do so by focusing on small details. “A lot of jewelry looks similar but the way it’s marketed and photographed is what makes or breaks it on Etsy,” she says. She learned that the best way to photograph jewelry is under natural light on a cloudy day because there won’t be a shadow in the picture. Using a simple piece of scrapbooking paper for a plain background, she takes pictures of her products on her porch -- both of the item itself and of her wearing it. Taking the time to learn what makes the jewelry looks best means it’ll be more attractive to potential customers. It’s a small step that makes a big difference. Three years ago, Secor didn’t have a high school diploma, much less a business degree. She had the Internet, though, and she used that to her advantage. There’s plenty of information out there, but you have to look for it first. When she wasn’t sure what to charge for her jewelry, she looked at what similar items sold for and priced her creations at a similar amount. Correction: An earlier version of this article misstated that Secor had already applied to the business program. She plans to apply in January 2016.